Your Partner for Airport Barcode Reading, Document Scanning, Self-Service Solutions, and more. 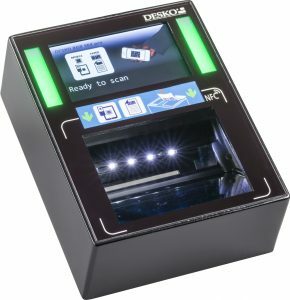 DESKO develops and manufactures hardware solutions for automated data entry and document checks. 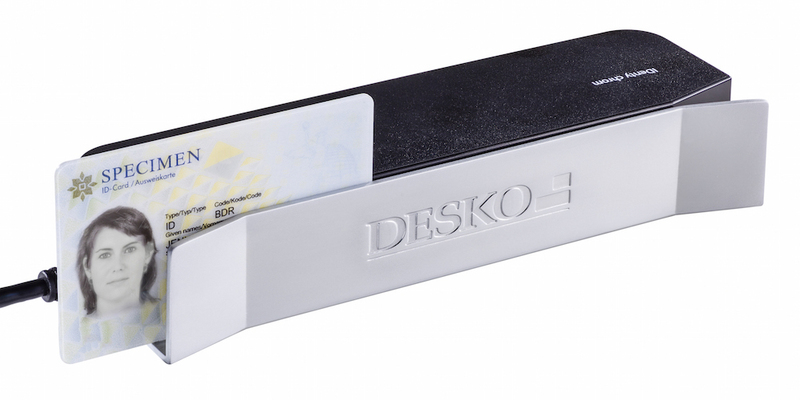 DESKO´s wide product range offers a perfect device for every passenger touch-point. From Check-In, Security Check, Retail, Passenger-Flow-Control to Boarding. Our devices guarantee a smooth and easy passenger journey from CHECK-IN to BOARDING. DESKO was founded in 1991 by Werner Zahn and Bruno Geyer. With their years of experience in digital data capturing and a lot of innovative ideas in mind, both dreamed of establishing their own company. The name of the company was found quickly: DESKO, an acronym for Data Entry, Solutions and COncepts. DESKO, not just a name, is the description of what the company provides to its customers. From airline and airport industry, to public authorities, to banks and hotels, DESKO´s fields of expertise are many, and helped, to became a successful international company with subsidiaris in the USA and Singapore, and sold products to more than 100 countries worldwide. 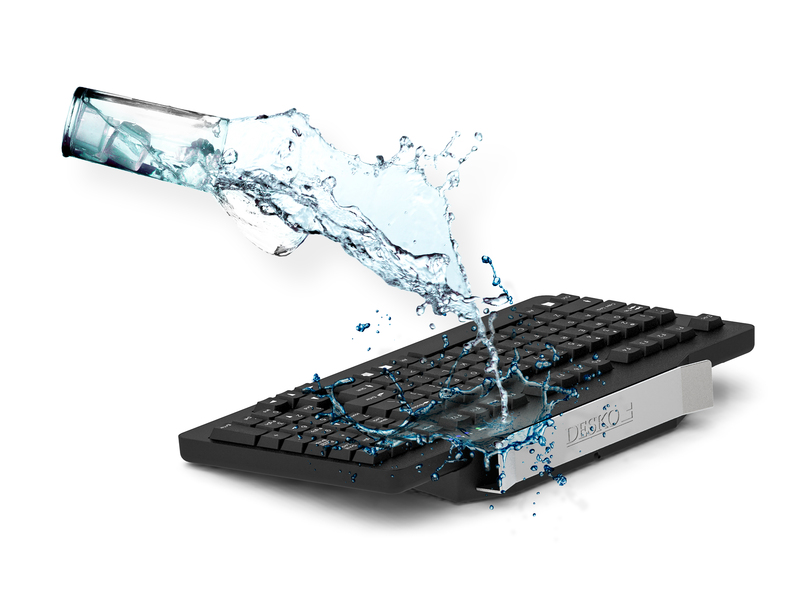 We are very proud to introduce our latest product to the market, our brand-new integrated keyboard NEPTUN chrom. 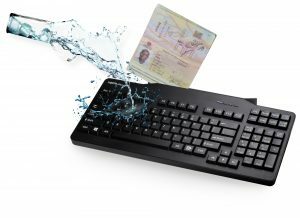 The NEPTUN keyboard will be equipped with DESKO´s well-known MRZ and MSR technology for passport or ID card reading and mag stripe card reading. But for the first time ever in the history of integrated keyboards it will also be completely water and dust resistant according to IP54 regulations. Not just the keymatrix and the key caps, the entire keyboard including swipe slot will be water and dust resistant. No more damaged keyboards due to water spillage. No more closed counters due to equipment replacements. DESKO´s brand new swipe reader IDenty chrom® is the latest addition to the chrom family (see also NEPTUN chrom keyboard) and the perfect companion for a fast and efficient data capture from ID documents such as passports, ID cards or visas. In addition, it also reads magnetic stripe and chip cards. The entire device including swipe slot is water and dust resistant according to IP54 standard. It withstands water spillages without functional restrictions. Due to its small and compact design, the IDenty chrom fits in even the narrowest workstation. In addition to the standard device, DESKO also provides the flexible solution IDenty chrom mobile with integrated Bluetooth® technology and battery pack. For more information on our IDenty chrom please click here. Our BGR 504 pro is the state-of-the-art boarding gate reader, perfect for integration into counter, kiosk or gates. It can also be used as standalone solution at the boarding gate. The scanner is extremely efficient and easy to use thanks to its large scanning area and built-in barcode engine for 1D and 2D BCBP reading. Its multicolor display and two large LEDs on each side give an immediate and highly visible feedback, whether the scanned ticket is valid or not, to the passenger as well as the agent. 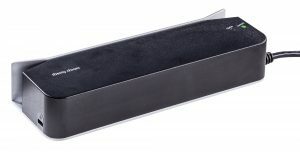 The DESKO BGR 504 pro is based on a robust flatbed scan technology for highest and super-fast barcode read rates. 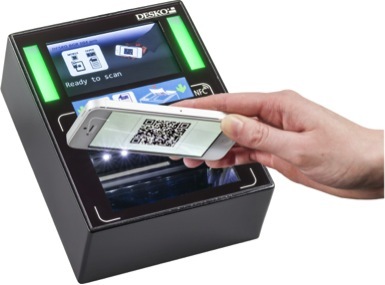 Because of its barrier free flatbed design the device allows for user-friendly mobile boarding pass reading from smart phones or large tablet displays (i.e. iPad). A large multicolor LCD display for text and picture display, multicolor LEDs for clear visual feedback and an adjustable volume control buzzer for acoustic feedback make the BGR 504 pro the ideal device for a fast and trouble free boarding process. DESKO’s smart device approach and optional features like NFC boarding guarantee a future-proof infrastructure and protect your investment. 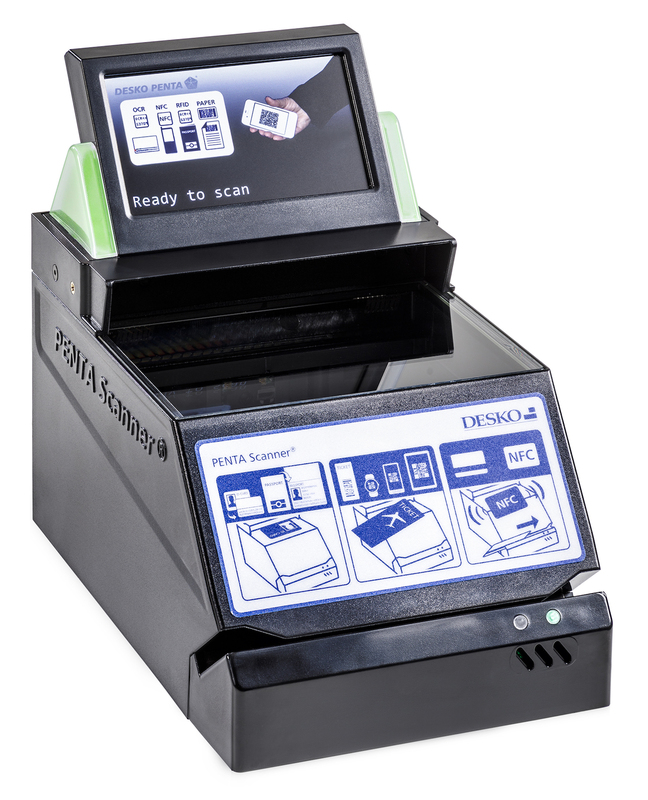 The DESKO PENTA Scanner® is your perfect device for scanning, collecting and authenticating passport or ID data. It is equipped with a state-of-the-art optical scan system, developed by DESKO, best suited for scanning ID cards and passports under IR, VIS and UV. It therefore provides excellent images for OCR data collection or document authentication. The DESKO PENTA Scanner stands out against other full-page scanners due to its variety on features like barcode reading, magnetic and smart card reading, the RFID module for biometric passport reading and its great visible feedback thanks to its multicolor touch screen and bright LEDs. Additionally, the PENTA Scanner® can be equipped with changeable battery packs and even WLAN/LAN/3G connectivity which give you the opportunity for a complete infrastructure independent operation at any time and location. Our unique PENTA platform with its various features and options covers all areas from check-in, security, passenger flow control to boarding.